The follow-up to the winner of multiple Game of the Year awards in "Oblivion", The Elder Scrolls series returns to much anticipation on 11/11/11 from role playing game fans. Will Skyrim meet the high expectations of franchise fans? A Story Unlike Any Other: The Elder Scrolls V (five, for those who didn't know), takes place roughly 200 years after the previous installment "Oblivion" took place. The story revolves a lot around the area of Skyrim, an environment much farther north than anywhere "Oblivion" took you. After the King died 200 years ago (in Oblivion), the defenders of the king (The Blades) began to die off or seclude themselves from the world due to having no job left for them. Soon after the King's death, the Empire begins to relinquish the lands it once ruled, taking away some of the independence of the cities and areas around the world. When Skyrim's king is assassination, leaving the throne vacant, a civil war breaks out amongst the people between rebel-like freedom fighters (Stormcloaks) and the Empire. Add in the fact that you are the last "Dragonborn", who is blessed by the Gods and tasked with killing dragons, and you've got yourself a stellar plot. The main plotline of Skyrim is actually very engrossing and as is usually the case with an Elder Scrolls game, can span hours upon hours taking you from numerous vastly different cities. As well as that, the ability to take on the main quest at your own leisure is truly something great, as you are not forced to attempt and "beat" the main storyline in any amount of time. Molding Your Clay: A large aspect of the Elder Scrolls series returns in the character customization. Since your character begins as a nameless, faceless prisoner you will be able to name and mold the appearance of your new warrior. The character customization is very similar to that which was featured in Oblivion and Fallout 3/Fallout: New Vegas. You can choose from "preset" appearances, but the fun is in molding every detail of your protagonist's face. The customization revolves around being able to use sliders to adjust your appearance. From making your nose or jaw longer and wider, or changing the shape of your eyes and lips, the sliders do change your appearance noticeably. What could be an issue for some though, is that you cannot distort your character's face in any significant way. You could make 20 completely different looking characters, but none of them will be grotesque or seriously misshapen. In addition to changing up your facial features, you can also add "warpaint" and dirt to your character's face. Some of the warpaint looks pretty silly, and there actually aren't too many options to choose from, but if you want to have your entire face covered with a mask-like design then you can. Dirt is similar, but less radical as you can adjust the amount of dirt on your face and choose from looking like a clean prisoner, a dirty hobo who fell face first into mud, or in between. Aside from altering your face, you can also change your entire race! Returning are the races that were available in Oblivion, but their appearance is noticeably different this time around. Argonian, Orc, Khajiit, High Elf, Dark Elf, Wood Elf, Imperial, Redguard and Nord are all available, and each race has distinctive characteristics and areas where they excel or lack in. For example, Argonian's can breathe under water and have a resistance to disease, whereas High Elves excel (but are also vulnerable to) magic. Dark Elves on the other hand excel at magic, have a resistance to it and are also adept in combat arts. Battlearchermage: Soon after molding your character to your liking, you will be thrown into the gameplay. You do not experience the best of Skyrim until you get out into the real world, but the first and really only "level" of the game does well at introducing you to the basics. You will be able to battle some weak enemies with swords and shields, and later bows and arrows, check out some low level armor types and just play a little bit to see what works for you and what kind of weaponry (or magic) you gravitate towards. You will also get to experience searching around for random goods (looking in barrels and searching bodies for anything of use), as well as the redesigned lockpicking system. Well, somewhat redesigned anyway. The lockpicking system of Skyrim is essentially identical to the one used in Fallout 3/Fallout: New Vegas. Instead of trying to manipulate the tumblers in a lock, you will now use the left and right thumbsticks to lock pick. The right thumbstick is used to move the lockpick around inside the lock, and the left thumbstick is used to twist the actual lock. If the lockpick is not in the precisely correct location, your lockpick will rattle and eventually break, forcing you to use a fresh one. Lockpicking in Skyrim isn't "original", since it was used in two Bethesda games already, but I do feel it as a solid improvement over the "tumbler" system that was used in Oblivion. I Believe I Can Fly...I Believe I Can Touch The Sky: Once you escape from your capturers, you will be thrust into the massive world where seemingly endless lands await you. You don't have many quests to do off the bat, but that doesn't mean there isn't a lot of action waiting for you out in the open world. The incredibly vast world has a lot to offer, even without quests and the fact of the matter is that there are a multitude of "games" within this massive one. It is easy to simply explore the forests and snowy mountains looking for animals (and other things) to hunt for hours on end, and the amount of time you spend doing "nothing" is astonishing. In addition to hunting (and eating!) your prey, you can go off and search out and discover new settlements, camps, mines, dungeons, secret hidey-holes, houses, towns and random people walking in the wilderness before you even complete a single quest. And in case anyone was worried, the game is "scaled" similarly to Fallout 3. When I say "scaled", I mean the difficulty of the game. There are many areas where you can explore and be able to defeat your enemies, but there are also some "zones" where you will be severely outmatched for the time being. Obviously as you become more powerful, you will be able to take on those previously difficult enemies with ease, but when you first start out you have to be mindful of what you are walking into. Of course, the beauty of Skyrim is that you do not have to be mindful at all. If you want to go skeleton-slashing in unknown mining shafts not knowing where you are going, you are completely free to do so at any and all times. The thing that makes The Elder Scrolls V (and previous Elder Scrolls titles) so special is that you can truly do almost anything, and go almost anywhere. If you see a mountain in the distance, you can trek there on foot and scale it as you battle monsters along the way. There is no set path in the game, and the world is so expansive that you can spend the first 10, 20, 30 hours not even touching the main quest...simply exploring, talking, killing, looting and eating. In fact, it is somewhat difficult to even verbally describe everything Skyrim offers in one review. There is a seemingly endless amount of things to do and most reviews of this game will not do it the justice it deserves, and if you combined all the reviews you could find I believe there will still be areas, weapons, quests, and exploration options that were never mentioned. There are many paths you can take with your character, even early in the game that helps shape what you excel at. Gone are the days where you had to choose your "Major" and "Minor" skills before you even had a chance to get into the game. This time around your character will become proficient in everything you constantly use, and areas you neglect will be where you are weak. If you are a fireball-throwing, bow and arrow wielding ranged fighter, then you will find yourself leveling up in "Archery" and "Destruction" but lacking in, say, "one-handed" weapon skills. I feel this is a change for the better, if only because you are not tied to one play style. In Oblivion if you had a character who "Majored" in Destruction magic and Blade, then you would have trouble using a bow and arrow or other magical arts besides Destruction. Change Is Good: In addition to pure exploration, Skyrim also features a number of noticeable and completely new features ranging from helpful to just plain interesting. One of the first additions you will see is the remodeled menu system. Instead of the menu system featured in Oblivion that took you away from the game as you managed your spells, inventory and map, Skyrim features a brand new menu system that is more transparent and doesn't take you out of the moment. When you open the menu you will still be able to see around you (the game is paused though, so no deaths while you access your menu) and even when you open your inventory you will be able to visibly see the items that you possess. You can see what gear, weapons, food and anything else look like before you equip/use it, which is a very nice addition. Not only that, but you can zoom in on and look at every detail of any item you have, and some items even have special clues hidden on them (look closely at a particular item and you may see something like a door-opening code on it). When you open your map, it no longer looks like a piece of paper that has locations marked on it. This time around you will see a zoomed out version of the world, complete with mountains and cities for you to see. The map system this time around is much more interesting and as you look around the map, you will actually see the locations change from snowy mountain areas to more lush grassy areas. There are also a few other improvements that have been added to Skyrim. One of them being the ability to have followers and take gifts from certain NPCs. If you are friends with select NPCs, you may have the option to accept (and even give) gifts. A related addition to the game is being able to have followers that help you on quests and can even carry things for you (since every RPG player knows being over encumbered is a big issue). Not everyone can be a follower, but there is an opportunity to recruit certain people you meet around the world that are willing to help you (for free or for a cost), each with their own strengths, weaknesses and skills. As well, you can even command some of your followers to open locked chests or doors, attack people or stay put amongst a couple other options! Another fairly small, but nonetheless very interesting new portion of the game are the "tanning", "smelting" and "cooking" abilities that can be used in conjunction with smiting and crafting. You can kill animals and take their hide to turn into leather stripes, which can then be used as ingredients to make armor. "Smelting" is a process that can be used when you find raw ore around the world, as smelting will turn those ores into "Ingots", which can also be used for armor and weapon production. Cooking is pretty self-explanatory as you will be able to add ingredients together to make concoctions that give you specific temporary boosts of attributes. Cooking takes the place of using a "mortar and pestle" in Oblivion. There is also the ability to learn and use "Dragonshouts" (a blend of dragon language), which can be learned from "word walls" scattered around the world. You can only learn new Dragonshouts at a word wall when you have a Dragon soul in possession while at the wall, and slaying a Dragon is no easy task. Dragonshouts come much later in the game but are a very interesting addition to the game. The Dragonshouts act almost like spells, allowing you to do specific things when you "shout" such as slow down time. They are not permanent and you have to "recharge" after using one, but can dramatically change the tempo of a battle, even when waging war against Dragons. In addition to all of that, a whole lot of new things added into the game, even something as simple as sneaking as been changed. Taking the place of the indicator used in Oblivion (an eye that got brighter or darker depending on if you are being seen by anyone) is a new system that again uses the eye, but in a different way. Instead of being brighter or darker, the eye-indicator is fully open, slightly open, or completely closed. A Moving Masterpiece: Another strong point of Skyrim is the visuals and sound effects in the game, both of which are very impressive. The Elder Scrolls V has surprisingly detailed sprawling environments, with little things like flowers, streams and snowy rocks on mountain sides looking incredible. Not to mention other, even smaller details such as butterflies floating around (that you can catch and eat), fish swimming in streams (another edible item) and blood on your sword after you kill somebody. The audio portion of Skyrim is also stellar, with all of the characters I encountered having great voice actors attached to them, putting life into even unimportant NPCs. The sound effects such as the sound of your weapon sheathing are more subtle but nonetheless visceral and eerily lifelike. 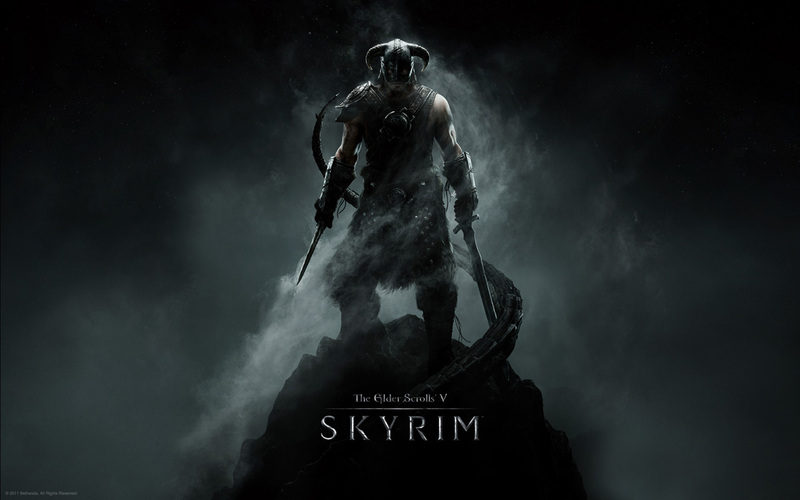 In addition, the musical score of Skyrim is fantastic and fits perfect into the setting of the game. From casual music playing as you explore to the music slowing down, changing or even stopping when in combat, the music in Skyrim is outstanding through and through. Rent vs. Buy: As I mentioned, words don't do this game a lot of justice. It is a truly epic adventure from the start and the amount of things you can do is breathtaking. Everything is very well done and this is about as well thought-out a title possible. Even from the start, Skyrim is a thrilling game where you often find yourself taking pleasure in the smallest things ("I found a Ruby that's worth 100 gold...nice!"). It only gets better as you begin to level up and experience an entirely new aspect to the world around you. Speaking of leveling up, even that system has been radically overhauled in what I believe is a huge improvement upon the old system. Whereas Oblivion forced you to sleep in a bed to level, and you could only pick three attributes to increase (such as Strength, Willpower, etc. ), Skyrim has taken an entirely different approach to it. When you level up, you are no longer forced to sleep. You simply select "Level Up" from the menu, and you look up to the heavens and choose what you want to improve yourself in. When you first level up, you will be able to increase your Health, Magicka, or Stamina. Health is self explanatory, but the other two aren't as simple. When you increase your Magicka you will increase the total amount of Magicka at your disposal, which will in turn allow you to cast more powerful spells for longer durations of time. If you opt to improve your Stamina, you will be able to carry more weight on your journeys and you will also fatigue slower when in combat (attacking causes you to fatigue). After that, you will be able to see symbols in the stars (constellations) that represent that particular skill. For example, when you look to the "Blocking" skill you will see a shield within the stars and if you check out the "Destruction" art you will find a fireball that is connected together by the stars in the sky. After you decide what skill you are going to choose (say Archery), there are a surprising amount of sub-categories in which you will be able to spend your "perk". You earn a "perk" every time you level up, and it can be used to give you a specific new ability relating to that skill. In Archery for example, you will be able to spend your first perk on the ability to cause 20% more damage with your attacks. As you put more "perks" into that ability, you will cause more and more damage with your arrows. After you max out the first ability, you move onto another that gives you another special maneuver. Say you finish off the "improve damage" ability in the Archery skill; you will then be able to use a "perk" to give yourself the ability to zoom in while your bow is drawn (the zoom acts almost like a little scope for your bow). Amongst that particular ability, you can also use your "perks" to earn the ability to duel-wield spells or weapons. If you so choose, you can assign spells to both hands and become a magical powerhouse, and you could even put the same spell on both hands with the chance to create one massive, ultra effective spell. The same can be said for swords, as you can duel-wield swords and turn yourself into an offensive beast. You lose the ability to block any attacks when you duel wield, but your offensive ability helps counter act that vulnerability. That is just a couple examples of how a simple skill can branch out and give you many different abilities. There are 18 total skills, and there are many areas where you can choose to upgrade yourself such as Destruction, Illusion and Conjuration magic arts, Light and Heavy Armor skills, Archery, Blocking (as in with a shield), or even things like Smiting and Crafting (a new addition to the game giving you the ability to create your own weapons and armor). This title could be sold for $100 and still be well worth the money. It isn't always incredibly fast paced like a first person shooter or something of the like, but is in a class of its own in the role playing genre. I think it is foolish to pass up on a phenomenal game like this, something that could easily give you hundreds of hours of gameplay. Usually when a game in this day and age does not offer a multiplayer option it gets a "F" in that category that will significantly lower the overall score of the title. The reason being, todays gamers expect, and most buy gaming titles for Online capabilities. Not having such an option is usually disastrous for a video game title. However, this title is so epic and does so many things perfectly that it would be an absolute crime to give it a "F" in the multiplayer category, thus lowering its overall grade. Therefore, we are going to go outside of the box and give Skyrim an overall grade of A+! A score we feel is a much more accurate representation of the totality of the game. With that said, I do think in the very near future Bethesda is going to need to entertain the idea of adding a multiplayer universe to these types of games. A "Guild Wars" type of Online environment would be something of epic proportions and probably catapult the already legendary series into the heavens they so artistically paint when you level up in Skyrim.